Here's the entry from the Boone County Property Valuation web search (the only easy, free way to find out who owns what in the county: (You do need to register with a valid email - they send you a password). 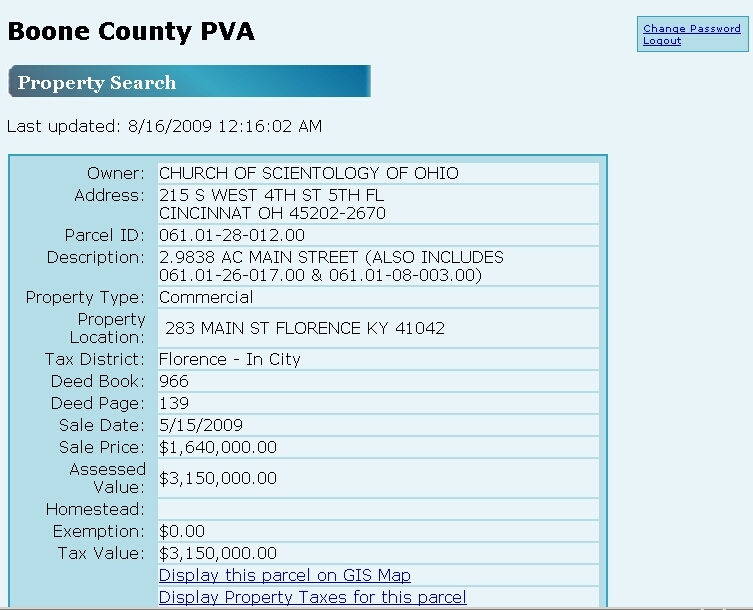 As you can see, the Florence property lists the CHURCH OF SCIENTOLOGY OF OHIO as the owner with an address still on Fourth Streen in Cincinnati, OH. Oh, and for some reason the tax rolls have Xerox listed as the owner when one searches using the "Display Property Taxes for this parcel" and search by address. Searching by the paarcel I.D. get an not found error. Re: Scilons keeping Fourth Street?? Well they can always update it when they actually move. Frankly I've seen no indication that they are leaving 4th St. but also no indication they are staying. Just keep filming loose paperwork and signage inside like we have been doing and we may eventually find out that way.